Baton Rouge, La. – The Sustainable Agriculture and Rural Development Institute (SARDI) will host its Community Spring Garden Workshop from 9 a.m. – 12 p.m. on Friday, February 15, 2019. The event will be held at SARDI’s office, located at 1209 Diesi Street, in Opelousas, La. 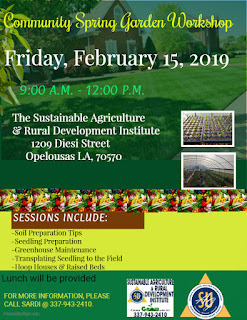 For additional information or to register for the Community Spring Garden Workshop, call 337-943-2410.